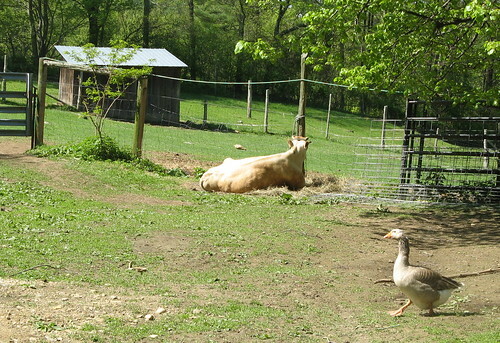 peaceful barnyard, originally uploaded by jahansell. Why are so many children's books about farms, and so little adult literature? Why are farmers considered comic figures? It makes no sense to me. Because animals tend to interest most kids, but few adults ? Atleast -literature- about them. I don't think that's so strange really, because animals are kinda limited, you seldom get a exciting sci-fi adventure, a suspense-laden-thriller or a tear-dripping romance out of a few cows. Now farmers, is a different matter, they may, in principle, be involved in any of these. But farming is seen as sort of old-fashioned and unsexy. Yah, take, for example, FFA. I once wrote a photo caption identifying someone as a member of Future Farmers of America. Then I got an irritated call from her saying that wasn't the name of her organization. "What does FFA stand for then?" I asked her. "It stands for FFA," she replied. Farming is considered so dorky that they took it out of the FFA name. Sad, if you ask me.